With polarized comments like ‘the reef is dead’ to ‘the reef is fine’ it can be hard to understand what is really going on with Australia’s natural treasure. In a nutshell – the reef tourism experience can still be great but coral health is rapidly declining and must be urgently addressed. 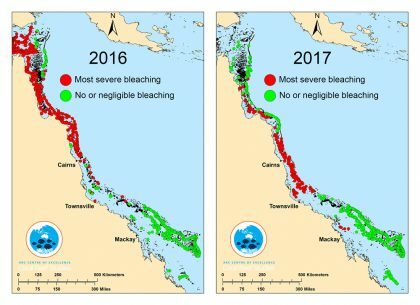 The 2017 summer brought about a second mass coral bleaching event on the Great Barrier Reef following abnormally high and prolonged water temperatures. This is on the back of the ‘worst coral bleaching event on record’ in 2016. 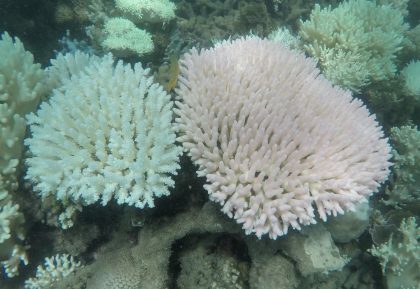 Now, it’s important to note that coral bleaching is not uniform – it varies significantly across species and locations and even across the same reef. 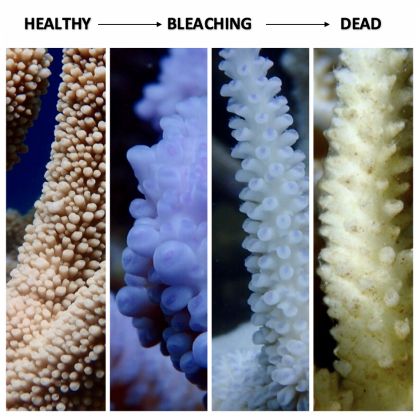 Also, although very stressful on coral, bleaching doesn’t necessarily equate to their death. If conditions improve within a few weeks then corals do have the ability to recover. So in looking at the long-term effects of coral bleaching it may be more helpful to talk in terms of coral mortality. 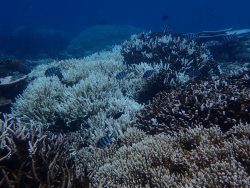 Figures can vary widely across news outlets but according to the ARC Centre of Excellence for Coral Reef Studies shallow water corals suffered 29% mortality in 2016 and 20% in 2017 – a shocking and sobering finding. In short, we don’t yet know what this means for the future of the Great Barrier Reef because it is the first time a decline of this magnitude has been recorded. ON THE NEGATIVE SIDE, coral reefs have never before faced the barrage of threats they do today (i.e. ocean acidification, warming, pollution, poor water quality, unsustainable fishing practices). However it is the pace at which the climate is changing that makes the situation particularly untenable. With our continued burning of fossil fuels more bleaching events are inevitable in the coming years leaving coral reefs literally and figuratively in hot water. ON THE POSITIVE SIDE, coral reefs are resilient and have survived on the planet for millions of years. They are dynamic and adaptable ecosystems and it is almost certain that corals will survive in some form or another into the future (however, may look and function very differently from today). There is a new and intriguing school of thought emerging in the ‘save the reef’ debate with some experts concluding that the lesser target of “protecting the ecological function” of the reef is more realistic than salvaging it. Their stance is that it is too late to preserve the reef as we know it, but if we can understand and maintain key ecosystem services we will avoid catastrophe for the millions of people who depend on coral reefs for their food and livelihood. The Great Barrier Reef is the best-managed reef system in the world with programs to increase reef resilience through improved water quality, sustainable fishing and Crown of Thorns starfish removal. These are all positive steps but we can’t fix a problem this far reaching and complex by just applying Band-Aids – we need to stop the bleeding at its source by reducing greenhouse gas emissions. Australia has dropped the ball (and does not even seem to be attempting to fetch it) with backwards policies and decisions such as supporting the Adani Carmichael coal mine which would spill hundreds of millions of tonnes of carbon dioxide into the air – exactly the opposite of what we should be doing at this critical time. Instead, Australia should be leading the global effort to reduce greenhouse gas emissions by taking decisive action to meet its Paris Agreement obligations (reducing emissions by 26 to 28 per cent of 2005 levels). Reef tourism and the wider community have key roles to play in sharing the reef’s story with the world. When the average person can understand the problems surrounding coral bleaching we can mobilize governments to take the necessary action. What will ultimately determine the fate of coral reefs worldwide is how quickly we stop burning fossil fuels and heating our planet. Positive and urgent action on climate change combined with effective reef management, increased investment in research and increased public awareness means the Great Barrier Reef still has a fighting chance. GBR Legacy is a not-for-profit organization with Tax Deductible status. Our team consists of marine scientists, educators, tourism operators and media experts with over 90 years of collective reef knowledge and experience. We aim to change the way the reef is protected by operating the Great Barrier Reef’s only INDEPENDENT research vessel. Our ‘floating laboratory’ will provide free access to scientists, an interactive classroom for students, a platform for collaboration between existing environmental organizations, and a multimedia powerhouse to share the news from the reef with the rest of the world. We believe that together there are no Barriers too Great to save our Reefs.